In August 2004, while she was attending tennis camp at Lake Tahoe, Mr. Pirate & I went camping for the week nearby. At one of the tourist shops, I found a bandana with a moose in each of the 4 corners. (I also found another bandana with all sorts of butterflies on it that I bought for one of my nieces.) As with the butterfly bandana, I made a really large (24" square) pillow from the moose bandana. 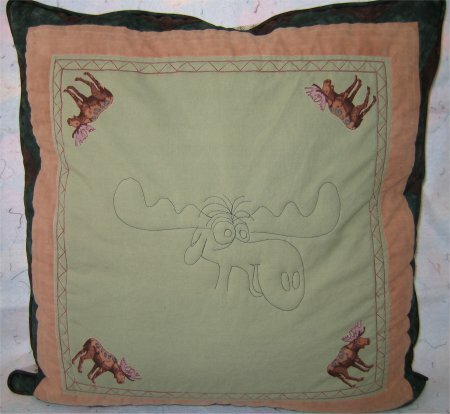 I found a picture of Bullwinkle Moose (of Rocky & Bullwinkle fame) and used it as a quilting guide for the center motif. I also made a sawtooth border to fit all the sides so that the pillow cover would fit the pillow form. The pillow has minimal quilting .. Bullwinkle's outline and stitch-in-the-ditch around the printed border motifs.